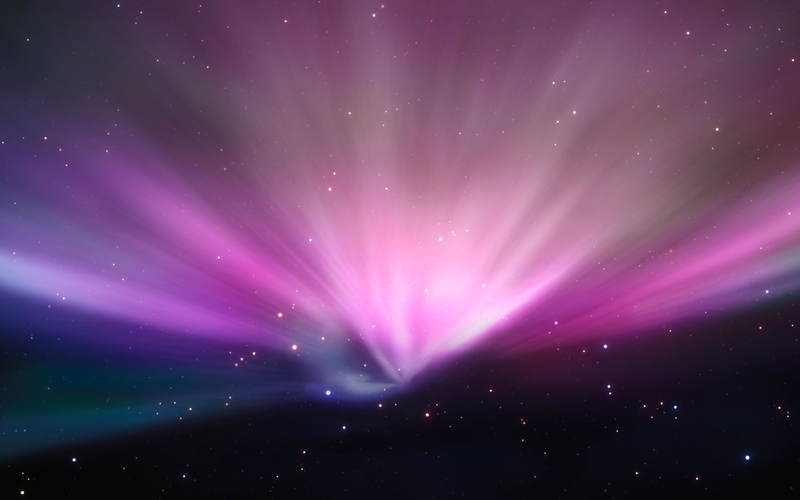 MAC OS has been traditionally known for their impressive graphical interface and stability . Now even though i have been an avid Linux follower over the past 9 years I have been using Linux , still i find my self attracted to MAC OS . Now even though these days it's possible to run Hackintosh on normal Intel hardware , but still it's not stable and well there are hardware compatibility issues . So well other alternative to using MAC OS is either to purchase MAC hardware(which would be naturally expensive) and run full fledged MAC OS or you could tweak and customize your Ubuntu desktop to look more like MAC OS X . 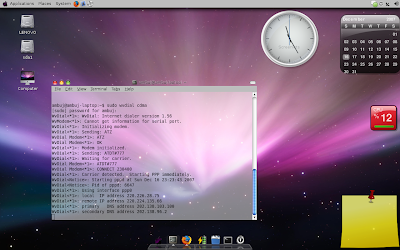 In this tutorial i describe step by step how to make your ubuntu desktop look more like MAC OS X Leopard :) . After downloading the cursor set extract cursors to the directory created in the first step. Now after completing the above steps go to the directory( cd $HOME/Leopard for me ) in the Terminal and issue the following command to combine the three theme files into a single .tar.gz archive . Now to install the theme package we have created in the above step , go to (System -> Preferences -> Appearance) and click Install and point to our newly created MyTheme.tar.gz archive. 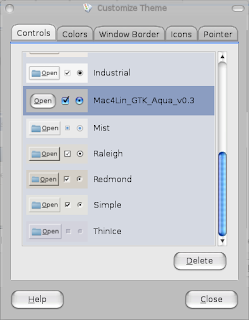 In this window in Icons chose LeopardX , in Controls Mac4Lin_GTK_Aqua_v0.3 , in Window Border Mac4Lin_GTK_Aqua_v0.3 and in Pointers White Cursor . If you have followed the steps properly the theme and icons should have been installed , and you should be able to see the new theme applied to your default desktop . After downloading the package , open (System -> Administration -> Log in Window ) and there go to Local and click on Add and point to the downloaded theme package (osx-login.tar.gz) . Now you would find OSX-Login theme listed in the window , select OSX-Login and close the window . Logout and Login again you should find the new theme installed . IMPORTANT : - Enabling Compiz-Fusion is essential if you want to use Screenlets , Avant Window Manager Properly . 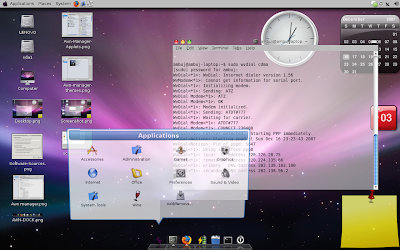 Unlike previous releases of Ubuntu where one had to manually download and install compiz,beryl etc (Compiz Fusion is composite window manager that provides best features of Compiz and Beryl) from Repositories if one wanted to have glitzy visual effects . 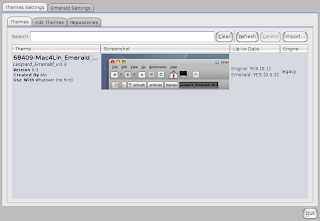 After installation is over , open Terminal from (Applications -> Accessories -> Terminal ) and issue the following command to install emerald which is necessary for using themes in compiz . 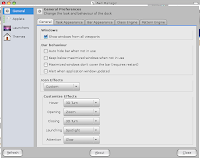 After Emerald theme manager opens click on import and point to the downloaded theme package from withing the Theme Manager , you will find Mac4Lin Theme listed select the theme , click on refresh and quit the application . Avant Windows Navigator is cool little tool that allows you to have a cute looking dock at the bottom of the screen . 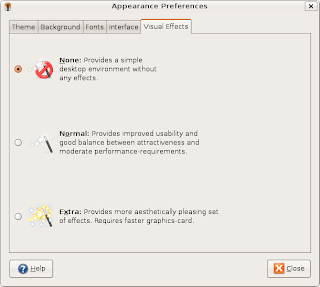 Even though AWN is still very buggy, still because it is so feature rich and cool looking you could install it . 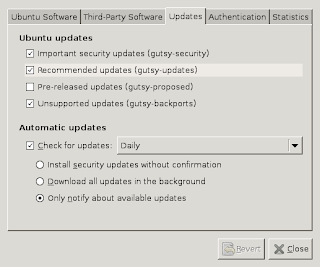 Before we begin installing first ensure Software Sources are in order by going to ( System -> Administration -> Software Sources ) go to the Updates and the window should like the image below with in Ubuntu updates box " first , second and fourth option " enabled . To install add in the following line at the end of file /etc/apt/sources.list by opening the gedit editor with the following command . 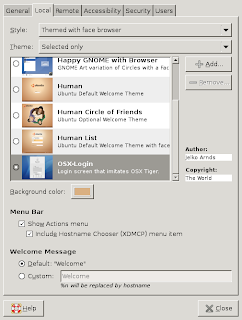 you could install this theme through AWN Manager . 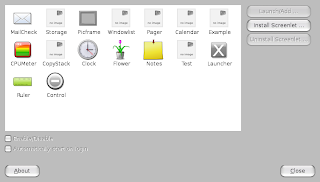 Screenlets gives user a collection of impressive widgets that can be placed on desktop this is similar to feature available on Windows Vista and Mac OS X Dashboard , it gives impressive look to the desktop. Now , After the installation is over you can add Widgets/Screenlets on your desktop by going to (System -> Preferences -> Screenlets ) , you will find a dialog box like this from where you could add Screenlets onto the desktop . yea i tried to install and do the above steps but when i try to install the tar file by going to System -> Preferences -> Appearance) and click Install and point to our newly created MyTheme.tar.bz2 archive.it gives me an error and i cant go any further.. please help.. i have extracted the files and everything but its of no use..
hey please please can you upload the combined theme file? i tried the instructions again and still cant get it to work.the icons get installed but nothing else installs. also, do you think this will work on 'linux Mint 4.0' also ? Can you tell us how to get the top Gnome bar to look like a Mac's? I was able to install the theme, but the mac like bar still had this 'yellow, green, red' button on the right instead of on the left (like the real mac) how to make it on the left..? Hey guys you can head to http://sourceforge.net/projects/mac4lin and download the complete package. 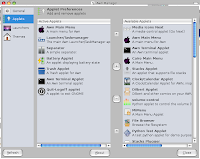 It has all the things to turn your computer to a Mac-look like with step by step instructions in PDF documentation. What is given here is quite fragmented. can't find the PDF documentation. I followed the instructions and it works like a charm. The only thing that does not work for me is the Screenlets eventually it's not available for AMD64 :(. Looks good on my 7.10 also. Could not get AWN to install and the Ubuntu cube won't function with the Leopard look installed. for the dock, i would use rk launcher leopard. it looks more like the leopard dock. also, to make this look like os x tiger, you could use fly a kite os x it downloads everything, even the startup screen! 21:11:46 ERROR 404: Not Found. go there to get the updated installation information!!! i just did it and it works beautifully!!!! adding gloobus (https://launchpad.net/gloobus)preview make your desktop look even better and more useful (gloobus preview is quick previev of files like in MAC finder). there is debian package available somwhere on the net as well. I urge patrons to vote for Mac4Lin if they feel it should win. I once again thank everyone for their continued support, feedback and appreciation. Mac4Lin exists today because of you all :) Do spread the word around about this. Hey when I run the command : sudo apt-get install avant-window-navigator-bzr after following the above steps, its says : E: Couldn't find package avant-window-navigator-bzr. Can you please help! is this compatible with karmic? ubuntu v9.10?